Stazzema is a three thousand-inhabitants small village in the province of Lucca 27 km away from Villa La Bianca. 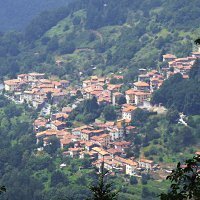 The town is part of upper Versilia, is the only one located within the mountains, thus being the highest town in Camaiore in Versilia. Surrounded by the Apuan Alps, Stazzema is in a unique position, presenting a wonderful view of the numerous villages scattered on the slopes of the mountains. The territory of Stazzema has remote origins, as it was inhabited since the Iron Age as witnessed by the findings of the pre-Roman tombs. A small village close to Stazzema, St. Anne, is known for the massacre of Sant'Anna di Stazzema, a massacre by Nazi troops that took place in 1944, when 560 victims were murdered. Things to see in Stazzema include: the Church of Santa Maria Assunta, an old church was mentioned for the first time in the ninth century, although its current appearance dates back in its architectural forms to the thirteenth century; the Shrine of Our Lady of Piastraio, or Lady of Beautiful Love, which is hidden in the woods and can be reached only on foot; the Church of San Sisto, located in Pomezzana; Antro del Corchia, an impressive cave which is part of the largest cave complex in Italy; the Church of San Pietro, which houses two fine marble altar frontals of the late fifteenth century; and the Historical Museum of the Resistance, dedicated to the history of Italy in general and Versilia in particular during the Second World War and the period of the Resistance. Stazzema, thanks to its territory, is also very popular for its many hiking trails that lead up to the Apuan Alps.